We’re almost 90% through this year, and if forced to name a general theme for this one it would have to be life changing. Not in the positive / transformative kind of way, but in the (what feels like) non-stop life altering phone call kind of way – far too many we’ve received from family and friends this year. We experienced something similar a few years ago, but this feels different. That was a year mired in the kind of grief that accompanies great loss; this has been a year entangled in a different sort of grief and a different sort of loss. A loss of innocence, perhaps, although that seems more trite and less nuanced than I want it to sound. It’s more like the loss of the notion that, in general, everything’s going to be okay – that our kids are healthy, they are safe, they are protected. As I type this now, it comes to me. It’s a loss of that guarantee that I foolishly signed up for, like an extended warranty with no stipulations on a legal enough looking document, apparently in invisible ink. It is not the kind of grief that lays you low, across the bed, immobile; just the sort of grief that let’s loss lap at your toes like the tamest of tides, while you nap or you eat or you read, never realizing that your chair has lifted beneath you until you’ve floated out to sea. The swim back is tiring, sometimes grueling, The ground is sand, and it swirls and tugs, opposite the direction I wish to go. I’m finding that it’s so very hard for me to live a life of teeny, tiny motions. I want – or maybe need – something big, very big. Something to occupy my hands and my head and my heart. Something bigger than the tiny heartbeat skip whenever my phone rings, something bigger than the tiny gestures towards progress on any number of projects or plans I have in front of me. There is this moment, when I’m running, and I approach a fork in the path. One way stays flat, the other climbs; my steps get smaller as I contemplate the choice. Then up I go, pushing hard against the imaginary resistance of the ascent. I let the words of my days pound against my rib cage and the pavement, and then I fly down the opposite side of the hill, exhilarated by the rush and the speed and the ease of big movements after small ones. The light is gorgeous, the trees are gorgeous, it’s all so absurdly beautiful that it feels removed from real life, which is sometimes decidedly not. 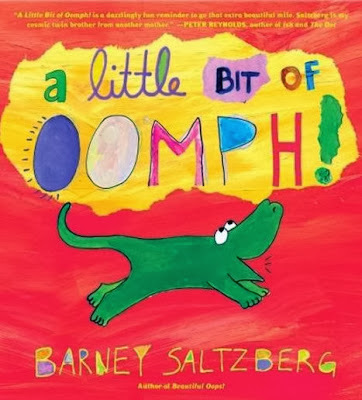 (story)time: A Little Bit of Oomph! E’s on a roll lately with author talks. Last Saturday she and a friend (and their closest 998 other friends) went to hear Rick Riordan speak, and to pick up a signed copy of his latest book. I’ve promised you some write ups on the books she’s into right now, but she’s been too busy rubbing shoulders with the big writers to sit down and write some reviews for this little blog. 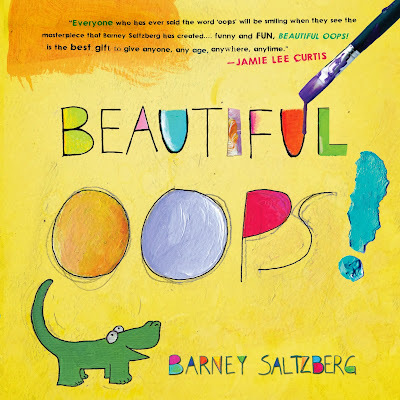 Today at school she got to meet Barney Saltzberg – and she said he was delightful and funny. I mentioned his book Beautiful Oops when I wrote about my favorite art books here, but he has a new book out in a similar format – A Little Bit of Oomph! We’ve only read A Little Bit of Oomph! well – a little bit – but the girls loved it. 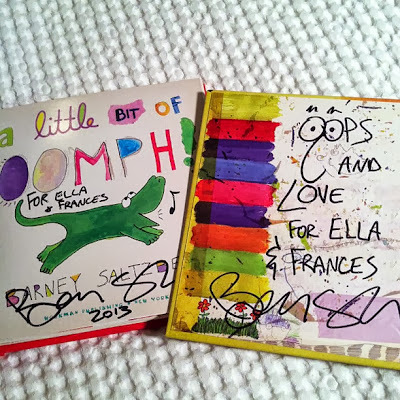 It has the similar mixed media illustrations, with flaps and pushes and pulls and spins – lots of interaction like Beautiful Oops. The message of the book is that a little bit of extra effort can go a long way towards turning the ordinary into the extraordinary. My favorite page spins the word curiosity into discovery – a fitting theme for an elementary school that encourages kids to do that very thing on a daily basis. E loves to read, but she also loves to write. I’m glad she’s getting so many opportunities to listen to and interact with authors as they explain the way they approach writing and sharing ideas with others. These books would make great gifts for kids ages three and up – wrap it up with the contents of your recycling bin, a good writing pen, a glue stick, and some acrylics and let them go to town.